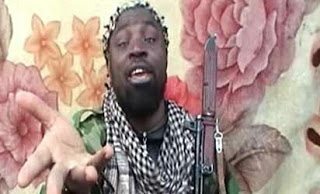 The leader of the Nigerian Islamist militant group Boko Haram denied that it entered into a ceasefire agreement with the government and endorsed an attack last week on a school in northeast Yobe state. Bloomberg reports that Abubakar Shekau, in a video message sent to reporters on Saturday, denied claims by the Minister of Special Duties Kabiru Turaki this week that a ceasefire was reached on July 8 after talks with the group’s deputy leader, Mohammed Marwan. Boko Haram, whose name means “western education is a sin” in the Hausa language, has killed thousands of people in gun and bomb attacks since 2009 in the mainly Muslim North and Abuja in its campaign to establish an Islamic state in Africa’s largest oil producer. Nigeria’s more than 160 million people are roughly split between Christians, predominant in the south, and Muslims, mostly in the north. The purported cease-fire came in effect two days after 20 students and a teacher were killed in an attack on a secondary school in the northeastern state of Yobe. Eli Lazarus, a spokesman for the joint military and police task force in Yobe, said the attack was probably carried out by Boko Haram. While Boko Haram doesn’t attack “children and young girls or old women,” he said, “Teachers that teach Western education, we are supposed to kill them in the presence of their students.